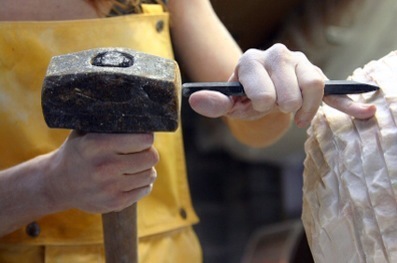 Have you ever watched a sculptor creating a new project? A block of stone, a log, a lump of clay or a heap of metal sits on their working area. They stare at each angle, sometimes for days, weeks or months; seeing something beyond what’s in front of them. Envisioning what could be; not what is. Then they pick up their tools and begin to remove what is not needed anymore. A hammer, a chisel, a knife or a torch. All very crude instruments that chip, burn or carve away the excess. For a while as they work, you can’t fathom what will be left or what they’re seeing that you can’t. Then the magic happens. A form begins to take shape and you marvel how you never saw that image before. There have been many times in my life that I thought I had myself pretty figured out. I was meant to be this “log” or this “stone.” But then something would happen that caused me suffering and loss. I could not understand how this was helping me become a greater person. In my limited understanding, I believed in order to be better than I was, I needed to be adding something new to who I was. I needed to be gaining and achieving; not losing and suffering. The more I tried to understand these hiccups in my plans; the more I thought about sculpting. When suffering and loss start, it begins an act of chipping and stripping all that nonsense away. The pain of eliminating our fluff makes it difficult to comprehend what will possibly be left. It takes that suffering to start creating and revealing exactly what we were intended to be. In my life when I was faced with almost complete loss and the only thing in this world I had left was my three daughters in their pajamas and the hugs of those who loved me; I entertained the concept for sometime that I was destroyed and that I had lost who I was. I prayed that God give me back my original form, but He just kept on chipping. As I continued begging, but having to continue living life in this more vulnerable form, I discovered that I had Strength I hadn’t known was possible. I now had Compassion that was not there before towards others who found themselves vulnerable. Most of all though, I had Peace and Joy. Somewhere among all the loss; I had gained. I have started to take the shape of who God sees in me and created me to be. He allowed loss to come in and take away what was no longer needed in order to show me the beauty of His creation. A simple reflection of Him.